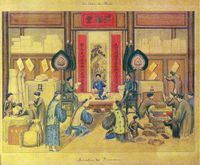 'La cour de Hue' portrays various components of the Nguyen royal court including lục bộ (the six ministries), the privy council, and royal ceremonies. 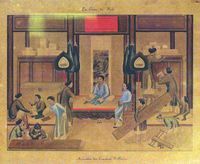 While many consider the collection to be a comprehensive look at the Nguyen royal court, only six paintings were found and displayed at the National Museum of Vietnamese History. The rest are thought to be lost. All the paintings were drawn in watercolor by Nguyen Van Nhan, a Hanoi-born painter. 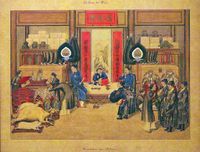 Nguyen Van Nhan is also the person behind the famous 'La Grande tenue de la Cour d’Annam,' a 1902 painting collection comprising 54 works that document the costumes and clothing of emperors and mandarins under the Nguyen dynasty. Bộ Công (Ministry of Public Works). 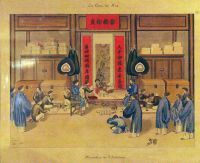 Bộ Lễ (Ministry of Rites). Bộ Lại (Ministry of Personnel). Bộ Hộ (Ministry of Finance). 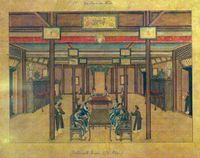 Viện Cơ Mật (Secret Institute/Privy Council). 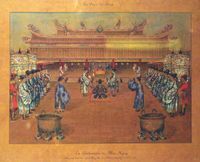 Lễ Phục Mạng (Phuc Mang Ceremony) — a ceremony where mandarins report the result of their civil projects in front of the emperor and the royal court.